The fuels in the area where the entrapment occurred consisted of mostly grass and scattered sagebrush. Fuel bed depth ranged from .5 to 1.5 feet. The “Aid to Determining Fuel Models for Estimating Fire Behavior” (Anderson, 1982) classifies this vegetation as Fuel Model 2. The primary carrier of the fire was grass. However, clumps of sagebrush, where present, did increase fire intensities and lengthen duration of the fire. The fuel moisture of the cured grasses ranged from 3%-4% at the time the entrapment occurred. The grass component of the fuelbed was completely cured. These moisture predictions were estimated from the closest Remote Automatic Weather Station (RAWS) site, Grass Creek Divide. The Grass Creek Divide RAWS is located at an elevation of 7100 feet on an exposed ridge 23 miles northwest of the entrapment site. Live woody fuel moisture values from the Grass Greek Divide RAWS site were in the 56% range. Probability of ignition reached 90% during the early afternoon of Friday August 11th. The fire danger indices for the Grass Creek Divide RAWS site for this time period exceeded the 95 percentile Energy Release Component (ERC), indicating the severity of the fire season. The Riverton, Wyoming National Weather Service Office reported on 08/14/00 that their area had received 4.59 inches of precipitation for the year, which is 1.32 inches below normal. The normal precipitation for this date is 5.91 inches. Above normal temperatures have been common this summer. The week of August 6th experienced Red Flag Warnings for many of the Fire Weather Forecast zones managed by the National Weather Service (NWS) at Riverton, Wyoming. Haines Index of 6 was forecasted for all days of the week for most zones, including zone 287, the area of the Kates Basin Fire. On Thursday August 10, 2000, 0600 hours, another Red Flag Warning was issued for that day and evening for many zones in the area, including zone 287. The discussion forecasted an upper level disturbance passing over the western fire zones that day. Specifically for zone 287, including the Owl Creek Mountains, the Red Flag Warning for August 10th through the evening called for temperatures to the mid 80's, minimum relative humidity of 10% to 15%. Twenty-foot winds on the ridges were to be southwest 10-15 mph in the morning and southwest 12-18 mph with gusts 20 to 25 mph in the afternoon. The August 10th, 0600 hours forecast for Friday the 11th, called for temperatures again into the high 80's and relative humidity from 10%-15%. Twenty-foot winds near ridges were to be southwest at 5 to 10 mph in the morning and west at 10- 15 mph in the afternoon. Haines Index again was forecasted to be 6. The updated, Thursday August 10th, 1500 hours forecast discussion included an upper level disturbance moving across the area that evening. The disturbance, in combination with mid and upper level moisture, would continue to fuel thunderstorms. The low levels of the atmosphere would remain dry. Wind gusts of 35 to 50 mph. The Friday, August 11, 2000, 0623 hours forecast issued Red Flag Warnings for many zones including zone 287, for dry fuels, very warm temperatures, low relative humidity, and gusty winds. The Red Flag included forecast for gradient wind increases in advance of an approaching cold front due to cross the forecast area Friday evening and into the night. The Friday, August 11th, 0623 hours forecast specifically for zone 287, forecasted Red Flag Warning for that afternoon through sunset, temperatures into the mid 80’s, and relative humidity of 15% to 20%. Twenty-foot winds near ridges were to be southwest 7 to 13 mph in the morning, and west northwest 15-25 mph and gusty in the afternoon. Transport winds from the west-southwest at 32 mph, with a Haines Index 6, and the air mass becoming unstable by 10 am. At 1200 hours Friday August 11th, the NWS Riverton, Wyoming office had their regular scheduled noon update. This update removed showers from zone 140 and isolated afternoon thunderstorms from zone 279. The remainder of the discussion was similar to the morning forecast. Specifically for zone 287, there was little or no change from the morning forecast except for the mention of gusty winds with the 20-foot winds near ridges of 15 to 25 mph. The Friday August 11th, 1500 hours forecast continued Red Flag Warning through sunset and again Saturday for many zones, including zone 287. Gusty winds, very warm temperatures, very low humidity again were the concern. The discussion of the Red Flag Warning included information that a jet stream maximum, moving to the north of the area, would increase winds once again. Line personnel reported winds relatively calm at 0900 hours on the 11th, then picking up to 3-5 mph out of the southwest with occasional gusts, later in the morning. After 1300 hours, the winds were reported to pick up in speed. By around 1400 hours, winds were much stronger, reported by fire ground personnel to be southwest 25-30 mph, with higher gusts. During the entrapment period, the winds speeds were reported high enough to rock a Ford Expedition, just west of the entrapment site, continuously for a period of a few minutes. The Grass Creek Divide RAWS reported 20 foot winds between 1315 hours and 1515 hours on August 11th ranging from 10-17 mph and gusting from 26-37 mph, southwesterly. The Grass Creek Divide RAWS is at an elevation of 7100 feet, exposed. Elevation at the site of the entrapment is approximately 6600 feet. All firefighters interviewed during the investigation were asked if any on-site belt weather kit observations were made and recorded. There is no record of any on-site belt weather kit observations made. The only requested, recorded, and received spot weather forecast to the NWS Riverton Office was for the Blondie 2 Fire on August 9th, 1215 hours. The Haines Index for August 11, 2000 was 6, the same given for everyday of that week. Based on atmospheric conditions over the fire, the Haines Index value of 6 (the highest possible), indicated a high potential for extreme fire behavior and large fire growth. These conditions contributed to the extreme fire conditions experienced on the afternoon of August 11th on the Kates Basin Fire. The Grass Creek Divide RAWS located in zone 287 recorded the following weather conditions for August 11, 2000. The topography of the Kates Basin fire was in mountainous terrain of the Owl Creek Mountain range running west to east. Elevation relief from Buffalo Basin on the flat due south of Mexican Pass to entrapment area was from 5000 feet to 6646 feet. The slopes in the accident area ranged from 20 to 25%. There were steeper slopes of 40 to 45% below entrapment site in a southwest facing draw. Primary aspects in the vicinity were southwest to south-southwest. 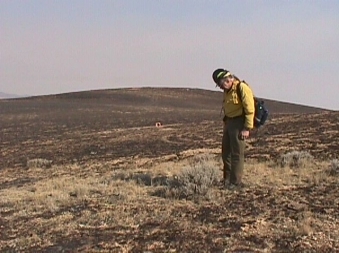 The area where the critical fire run occurred averaged 25% slope and a southwest aspect. The exposed aspect, chutes, and saddles of the entrapment area to the forecasted and experienced winds are all contributing factors to the fatality. The fire burned on all aspects. Fire behavior predictions were not made on the Kates Basin Fire during the week of August 6th, including August 11th. The fire during this period had progressed from an initial attack to an extended attack stage. Acquiring RAWS outputs, weather forecasts, and using information from interviews, witness statements, and on-site visits, fire behavior predictions were calculated to determine rate of spread and fire intensities just prior to and during the entrapment of the engine and firefighter. Fuel Model 2 NFFL Fuel Model 2 was used to model fire behavior in grass with scattered sage overstory and litter. (Note: Fuel Model 1, continuous cured grass fuels, was reported by firefighters near the ridges and exposed areas. Fire behavior calculations were made with similar weather inputs, however, the outputs from these calculations exceeded the wind limit for the model. Therefore, only Fuel Model 2 will be reported). 1 hour fuel 3-4% 1 hour fuel moisture was calculated using the Grass Creek Divide RAWS temperature and relative humidity. 10 hour fuel 4% Value from Grass Creek Divide RAWS. 100 hour fuel 4% Value from Grass Creek Divide RAWS. Herbaceous 4% Value from Grass Creek Divide RAWS. Live Woody FM 56% Value from Grass Creek Divide RAWS. Mid-flame 8-23 Recorded winds (mph) from Grass Creek Divide RAWS station at 1415 hours (approximate time of entrapment) averaged 14 mph and peaked at 37 mph, south-southwesterly direction. Slope 25 Slope averaged 20- 25% on the southwest-south aspects in the proximity of the entrapment site. The calculated rate of spread (ROS) prior to and during the entrapment ranged from 135 chains/hour to 879 chains/hour at peak wind speeds, or from 148 feet/minute to 967 feet/minute, (ranging approximately 2 to 11 miles/hour). Flame lengths (FL) during this period are calculated between 12-30 feet. Visual observations of flame lengths during the blowup period were reported from 25 to 30 feet. Fireline intensity was calculated to range between 1396 and 9084 BTU/foot/second. The predicted rate of spread and flame length are in a range that far exceed control options. The Kates Basin Fire was reported on Monday August 7, 2000 at 1430 hours. The reported lightning-caused fire had grown to 590 acres by the end of the day. On August 8th, at 1800 hours, the fire had covered 15,000 acres. The August 9th, 1800 hours report estimated the fire size at 18,000 acres. By August 10th at 1800 hours the fire had reached 31,000 acres and was over control lines in many areas. During the mid to late morning hours of Friday August 11th, fire behavior was reported to be creeping spread rates with flame lengths 1-4 feet high. Between 1000-1100 hours, an observation of fire behavior near the area of entrapment on a southwest aspect, described flame lengths of 1-2 feet. At approximately 1300, winds started to pick up and fire behavior increased in intensity. Support from a helicopter assisted in controlling this area near the entrapment site. Observed fire behavior during the entrapment period of 1430 hours on the 11th included flame lengths between 25 -30 feet and estimated winds on site of 40 mph. These winds, coupled with extremely low 1 hour fuel moisture and the effect of 25-45% slopes, chimney and saddle effect, with an exposed southwest aspect directly in-line to the prevailing winds, presented extreme fire behavior conditions in this fuel type.